In this seventh-grade humanities lesson, students prepare a Middle Eastern meze platter using ingredients that represent the four major climatic regions of the Arabian Peninsula. They learn that the geographic location of the Arabian Peninsula has made it a center of trade throughout world history, and that this in turn has shaped the region's cuisine and made the meze platter an iconic dish throughout the region. Identify the four climatic regions of the Arabian Peninsula and the crops native to each region. Understand how the climate of each region influenced the lifestyles and diets of people native to that region. Refine knife skills and practice different cuts and sizes. Answer questions about the climatic regions and foods of the Arabian Peninsula. Describe the four climatic regions of the Arabian Peninsula and discuss their effects lifestyles and diets of people native to each region. Cut vegetables into a variety of sizes and shapes based on how they will be eaten (either for dipping in hummus and yogurt sauce or eating in a pita pocket), and arrange the cut vegetables on a platter with attention to presentation. Collect all the tools and ingredients and distribute them to the tables. Copy the Pita recipe to hand out. Copy the Hummus recipe to hand out. Copy the Yogurt Sauce recipe to hand out. Make a batch of pita dough. Allow to rise 30 minutes to 3 hours at room temperature, or overnight in the refrigerator. Welcome students and introduce them to the lesson of the day: a Middle Eastern meze platter. The meze platter is a perfect example of how secrets of world history can be unlocked simply by studying the food we eat. First, let’s take a moment to recall the previous lesson because today’s story is directly connected to our story from last week. Ask for student volunteers to summarize a few key points from the lesson: During the Song Dynasty, Chinese scientists, engineers, and farmers developed new technology to grow rice more efficiently, which resulted in a surplus, which led to population growth, urbanization, and a burgeoning of cultural, scientific, and technological development. Trade is the invisible force behind all of this. Last week we talked about all the incredible innovations that occurred in China during this time. This growth and innovation were a direct result of people having a more secure food source, and they were also entirely dependent on China’s ability to trade and sell the surplus rice and new goods it had with other societies. This takes us to the Arabian Peninsula. Ask students to recall the Silk Road lesson series from sixth grade, when they made dumplings, curry, pasta, and rice pudding. Explain that today we’ll be moving west along the Silk Road to the Arabian Peninsula in the Middle East. Explain that the Arabian Peninsula was the center of trade—for knowledge, ideas, technology, goods, and food—between the civilizations of Europe, Africa, and Asia for thousands of years. This bring us back to our recipe for the day: a Middle Eastern meze platter. Ask for a student volunteer to describe what a meze platter is (a variety of small snacks eaten together as a meal). Meze platters originated in the Middle East, and today are enjoyed all over the world, especially throughout the Mediterranean region. Typical components of a meze platter include vegetable salads, grilled meats, dips like hummus and baba ganoush, cheeses and yogurts, olives, pickles, and flatbreads like pita. Meze platters are symbolic of the importance of trade in Middle Eastern history. Every area has a unique meze platter based on its traditional dishes and ingredients of the region, and mezes change seasonally. They are a dish made specifically for socializing, and the story goes that they began thousands of years ago as a way for people to gather around the table with traders or travelers from out of town, to share some of the local culinary specialties and enjoy small bites of whatever the visitor had brought from far away. This mixing of local and foreign food is typical of Middle Eastern cuisine: As a cuisine that developed at the crossroads of civilization, almost every Middle Eastern dish is a mix of ingredients and techniques from near and far. Today we’ll be making a meze platter with pita, hummus, yogurt sauce, and raw vegetables. In keeping with the tradition of meze, we’ll be using seasonal vegetables from our garden, as well as ingredients from farther away. Our meze represents ingredients from all four climatic regions of the Arabian Peninsula. 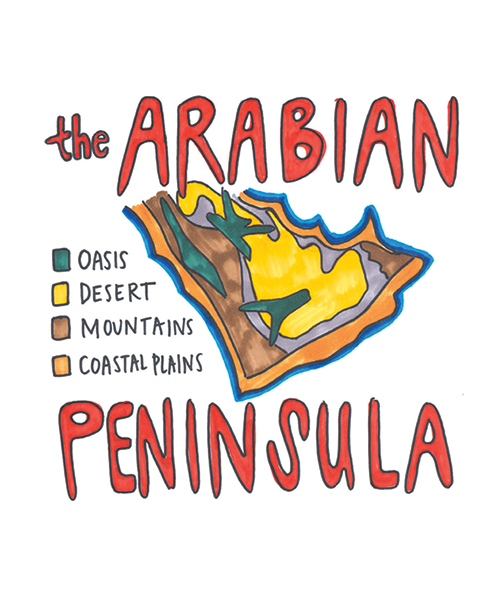 Ask students to identify the four climatic regions of the Arabian Peninsula: desert, oases, coastal plains, and mountains. Review how climate and geography influence lifestyle and impact diet. Factors such as temperature, precipitation, and soil type determine what you are able to grow to eat, what materials are available to build your house with, etc. Date Palm (Oases): Regarded as the “tree of life.” Part of the tree was used: the fruit was eaten, the sap was drunk, palm wood was used to build houses, the leaves were used for roofs, the fibers were woven into rope, hollowed-out trunks were used as irrigation pipes, and date pits fed to camels. Wheat (Coastal Plains): Originated in the Middle East and was first domesticated by the Mesopotamians. Pomegranate (Mountains): From Persia; are an important symbol in many religions and culture, often as a symbol of fertility; believed to be the “tree of knowledge”; the modern-day word for hand grenade originates from the French word for pomegranate, grenade. Yogurt (Desert): The nomadic peoples of the desert relied on their herds of goat and sheep for everything from food to shelter. Garbanzos: Originated in southern Turkey but very important in India, Pakistan, Latin America, and Europe; also known as chickpea, Indian pea, ceci bean, Bengal gram. The meze we’re making today is an Edible Schoolyard–Arabian Peninsula fusion meze. While we’re cooking, take a moment to reflect on what dishes you might include if you were to make a meze platter that represented your own home and culture. Ask students to wash their hands and join their table groups. Review the recipes. Emphasize that both the hummus and yogurt sauce are "flexible recipes," which means that adjusting the written recipes according to taste is an important part of preparing both dishes. Demonstrate how to cut vegetables into a crudité. Emphasize that attention to detail and presentation are key in preparing today's platter. If there is time, ask students to share what foods they would include if they were to prepare a meze platter that represented where they come from. We produced a series of flipped classroom videos to save time during kitchen classes and ensure that all students could be engaged by the content typically presented during our classes' opening Chef Meetings. Students watch the videos before they arrive in the kitchen classroom. This means that the opening Chef Meeting can be a quick recap, with students explaining what they learned – gaining more time for discussion, cooking, and cleaning. Use this version if student watched the flipped classroom video. Welcome students and introduce them to the lesson of the day: a Middle Eastern meze platter. We're going to prepare a variety of dishes for our meze platter and take a closer look at how the unique geography and history of the Arabian Peninsula have turned the meze platter into an iconic dish throughout the Mediterranean. Trade is the invisible force behind all this. Last week we talked about all the incredible innovations that occurred in China during this time. This growth and innovation were a direct result of people having a more secure food source, and they were also entirely dependent on China’s ability to trade and sell the surplus rice and new goods it had with other societies. This takes us to the Arabian Peninsula. Explain that today we’ll be moving west along the Silk Road to the Arabian Peninsula in the Middle East. Explain that the Arabian Peninsula was the center of trade—for knowledge, ideas, technology, goods, and food—between the civilizations of Europe, Africa, and Asia for thousands of years. This brings us back to our recipe for the day: a Middle Eastern meze platter. Meze platters originated in the Middle East, and today are enjoyed all over the world, especially throughout the Mediterranean region. Typical components of a meze platter include vegetable salads, grilled meats, dips like hummus and baba ganoush, cheeses and yogurts, olives, pickles, and flat breads like pita. Today we’ll be making a meze platter with pita, hummus, yogurt sauce, and raw vegetables. In keeping with the tradition of meze, we’ll be using seasonal vegetables from our garden, as well as ingredients from farther away. Our meze represents ingredients from all four climatic regions of the Arabian Peninsula. Think-Pair-Share: Before coming here, you all saw a video about the four climatic regions of the Arabian Peninsula. Take a moment to think back on what you remember from the video. Use the visual aid for reference. Give students 10-20 seconds of silent reflection. Now turn to a neighbor and take about two minutes to recall as much as you can from the video. See how much detail you can use to describe the four climatic regions represented on the poster, and see if you can identify which region each of our recipes represents. Facilitate a full-class summary of the content from the video: With a raised hand, who can share one or two points from their conversation with their neighbor? Ask students to identify which climatic region each component of the meze represents. Making the pita: It is very difficult to go wrong with this recipe, but it yields the best results if you proof the yeast and knead the dough thoroughly. To proof the yeast, mix it with warm water and sugar as your first step, and allow the yeast-sugar mixture to sit while you mix the other ingredients in a separate bowl—then mix the two bowls together. Allow at least 5 to 10 minutes or more to knead, and be careful not to tear the dough. Pressing the pita relatively thin for baking (about ¼ of an inch) will help it rise to a pocket (the high heat of the oven also makes a key difference here in whether it pockets or not—ideally, the oven is so hot that the outside cooks quickly, trapping steam from the inside as it cooks, and causing the bread to puff). If you have time, 5 or 10 minutes of rest time after kneading before shaping can help. Selling the yogurt sauce: Making a connection between ranch dressing and yogurt sauce can often increase student buy-in. Making the hummus: Hummus can be one of the most popular recipes we make, but can also be one of the least, depending on whether or not the cooks add enough salt, acid, and fat. Students are always very excited to create something really delicious that compares to what they get at the store, so we often provide a fair amount of support in helping students to analyze what they're tasting, and to keep working on the recipe until it is "delicious" and not just "okay." A good prompt here is: "That's pretty good. Do you think it could be better?" To smooth or thin the hummus while maximizing flavor, try adding bean-cooking water instead of plain water. Create a virtual meze platter: This can be a fun conversation to have around the table while eating. For example, "I'm having a meze platter party at my house. I'm bringing tamales because they're important to my culture. What are you bringing?" Prompt each student to take a turn sharing something important to their home or culture to create a table group meze. Once it's been made, see if there is anyone who can remember what every person is bringing. Selling the dates: Students tend to love the dates once they try them, but can be hesitant to try one at first. We call dates "nature's candy" or "the sweetest thing you can get off a tree," and that usually drums up any enthusiasm that may be lacking.